The 2017 Miramichi Festival of Tall Ships proudly presents The Gulden Leeuw, a massive and majestic vessel that originated in the Netherlands in 1937. This Dutch ship was built on behalf of the Danish Ministry of Agriculture and Fisheries and was given the name DANA. Originally designed for ice-ocean voyage, it was built for research in marine biology and was sold multiple times between 1937, 1980 and in 1984. Finally purchased in the year of 2000 by the Danish Naval school, it was named Gulden Leeuw (Dutch for Golden Lion), and was then fully restored to its natural beauty and retrofitted with state of the art sail training equipment. In 2007, The Gulden Leeuw was converted into a three-masted topsail schooner making it one of the world’s largest three-mast-topsail schooners. At a staggering 130 ft high and 121 feet short of a foot ball field, The Gulden Leeuw is 179 ft long. 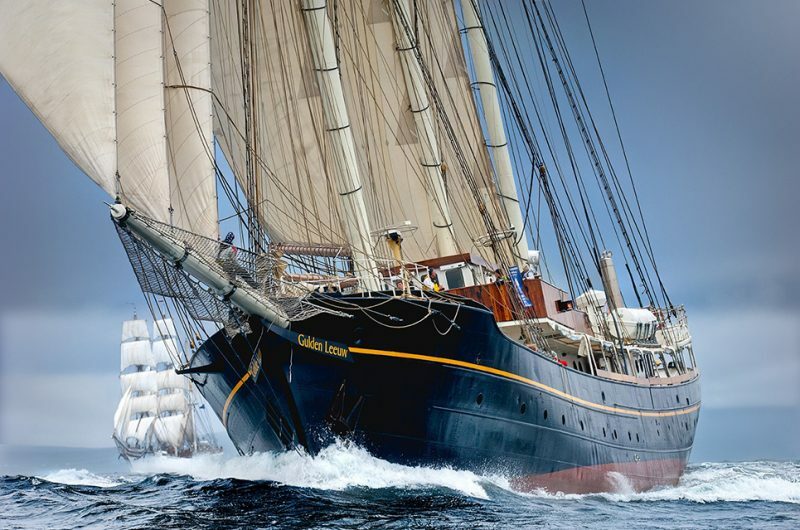 The Gulden Leeuw has travelled all over the world from Northern Europe to the East and West coast of North America, as well as Antarctica, the Black Sea, the Pacific Ocean and of course Canada! Able to carry up to 60 trainees, along with 24 permanent crew members, The Gulden Leeuw is able to host up to 200 visitors as well. The Gulden Leeuw is equipped with single and dormitory bedrooms, along with private showers and bathrooms. This vessel features an eat-in kitchen and dining room, recreational area and a variety of resting areas that provides complimentary views of beauty and wonder as you watch the sun dance off the gentle waves of the sea. At first glance, you will be amazed and left breathless at the Gulden Leeuw’s magnificent pearl white sails and large structure. The midnight shade of black that covers the body of this ship perfectly complements the deep blue colors of the sea. The Gulden Leeuw features handcrafted beauty made from high quality, rich materials with the luxurious style of the 1930’s. Join us this year for the 2017 Miramichi Festival of Tall Ships and travel back in time to the elegant age of 1930’s and experience the Gulden Leeuw.